In all of our websites, you can embed payment buttons, a PayPal shopping cart, videos, music, Flash slideshows, Google Maps, Google click advertising (AdSense), and much more. However, if you specifically want to build an online shop, we've got that covered. We have created a range of online store website designs which can speed up the creation of your new website. After signing-up, just log into your website toolkit. Then, simply name your product groups, upload your product photos and finally, add your PayPal payment buttons. It's quick and easy. 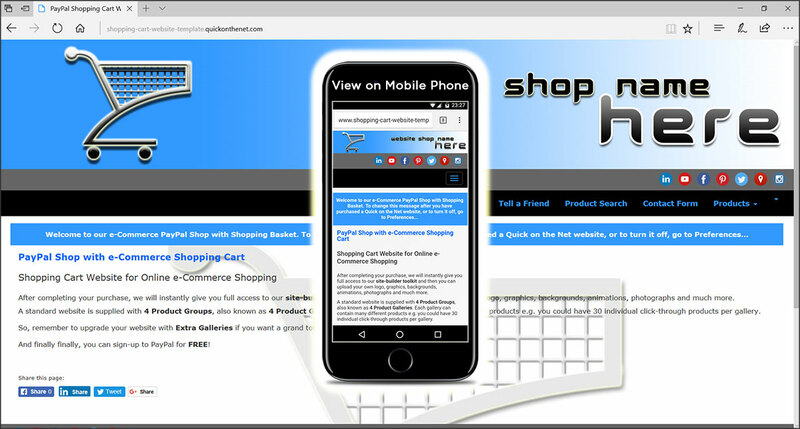 Your website is supplied with a product search bar. So, this means that the products you add to your websites are completely searchable, based on the keywords you add to each product description (each gallery item). What's more, the products can also be indexed and searched on external search engines, such as Google, Yahoo and Bing (Live / MSN). Are you ready to build your own PayPal Store? This is fast and simple! In fact, we believe it cannot be made any quicker, easier or cheaper than this. Tell us the name of your online shop and you can start selling your products to your own customers on the internet in no time at all. Just log in, name your product groups, upload your product photos and finally, add your PayPal payment buttons. Easy! We offer a stylish range of pre-designed website templates for business and sport. We have done everything possible to give you the ultimate creative freedom with your new website. You can use one of our templates as a starting point and then customise it for your own use. For example, you can easily add your own business logo, change the colours around and upload your own pictures. You can also add and remove menu buttons or web pages to suit your needs.